Management. Since then Microsoft created new applications and I would like to take a closer look at one of them: Microsoft Planner! Or how it’s also called: Planner or Planner for Office 365. Well, it doesn’t get much easier than this. In this 10 minute video, made by Microsoft, almost everything you need to know to get started is explained. But keep in mind that this is a product created just recently, and in this day and age you will have trouble getting a finished product… ever! And here comes the rant ;-). Microsoft Planner, just like Microsoft Power BI is undergoing a constant update and upgrade. 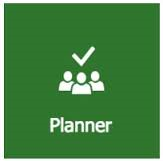 Because Planner is only available as part of the Office 365 offering it can be updated by Microsoft as they see fit. Now this is a good thing in the long run, don’t get me wrong, but for now we have to do with “new product syndrome”: a few things that are currently lacking in Microsoft Planner include the lack of using basic CTRL+C, CTRL+V HOME and END keyboard shortcuts in the text fields. Making you whisper “Doh!” every now and again. To get an overview of what Microsoft is up to with the product you can check out the uservoice page created for Microsoft Planner. By the way, Microsoft has uservoice pages for nearly all of their products now. A great way for the world to let Microsoft know what it wants next! Did you view the video? Well one thing might have stuck with you, for me it was the term Work management. Microsoft planner is a Work management tool and not designed for Project management. But then again, Microsoft Excel wasn’t either, but still we use it right? In Microsoft Planner every task that needs to be performed is a card. Currently you can assign 1 person per card. On this card you can add a multitude of items, such as checklists (each checklist item can be promoted to a card itself). You can also add documents, images, notes and links. It’s all quite easy, and by default you have 3 modes a card can be set in “not started”, “in progress” and “completed” making it easy for you to update the schedule fast. The lack of depth in the schedule might be a reason for you to find a more powerful tool such as MS Project or Project Online. But that’s the joke! They coexist just great. Microsoft Planner comes with almost any Office 365 subscription for organizations. And you can use it for the Agile parts within the schedule and have linked tasks, resource allocation, time writing, power BI reporting by using the Project Online environment. We do this at Projectum with the current project I’m on, and it’s great! Right from the start, on the main page called the Planner hub you get a nice, fast overview of how your projects are doing. You have the option to add a plan to your favorites, giving you the option to see a circle with the general progress of the plan. But there’s not much more that can be said about reporting. Update 2-10-2017: Brian Smith did a very good set of articles (four in total). You should really read those if you are serious about reporting on Planner. Yes, collaboration is key, you get an ideal way to send files, chat and share progress on the project. There’s a “Group” created for every plan, meaning that you have a shared calendar and outlook e-mail address, as well as a shared OneDrive capable of storing 1 TB of data. Now that’s nice! And the integration with Outlook is another big plus, because we all know that the business world still lives in the mailbox ;-). Not really, but a common process and a set of rules about how to approach the plan would be desired. Because of the huge freedom for any plan participant to add, update and delete items, a good project manager (scrum master) is needed to keep the order. And good project managers are trained! And need to continue updating and upgrading their skills. The part in Bold is what I find so nice about the method. And with a tool like Microsoft Planner I believe we can achieve this faster and easier then with many of the competing tools out there. Including Excel, Trello and even Microsoft Project. Microsoft Planner is new, and maybe it needs some time to settle in our systems. But when it does, this could be a killer application for most small and medium sized projects. It can also be used in combination with Project Online to facilitate bigger projects such as the one I’m currently working on. But please keep in mind, it has limitations compared to the Enterprise Project Management tools out there. Don’t mistake Planner for a full blown Project Management application just yet. Would you like to know more about the application, head on over to Microsoft’s blog. Or contact Projectum to get a demo :). Last but not least, thank you for reading the posts on The Project Corner Blog! It takes me quite some time to write and investigate the content for a new interesting post. And the great feedback and continued (50+) visits daily are a huge incentive to continue. If you like to read some more, you can find something of interest at the About posts, or the five incorrect ways of using Microsoft Project.